I say, a really ‘top drawer’ performance by all. Truly superb, five stars. 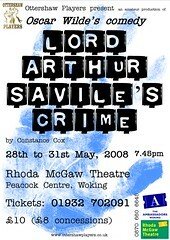 Last week at the Rhoda McGaw theatre in Woking, the Ottershaw Players took to the stage in what was really an excellent production of Oscar Wilde's "Lord Arthur Savile's Crime". Lord Arthur, who was beautifully played by Mark Holton, spends the duration of the play desperately trying to commit murder in order to fulfil a prediction. The comedy was fast and furious as one unlikely scene moved seamlessly into the next, with each new character bringing in more and more opportunities for laughter. So much so, in fact, that if I were to criticise the production at all it would be simply to say that the script was a little long, which is not the fault of the Ottershaw Players, of course, but a couple of cuts to lose about ten minutes overall would have been welcome relief from the exhausting pace of the play. The cast of ten were superbly directed by Peter More, who had a lightness of touch essential when presenting a period comedy. The actors almost all managed to avoid the pitfalls of caricature, and played their parts with realism. There were some really lovely performances, most notably Mark Holton in the title role; Matthew Horton as his eager to please butler, Baines; Alison Byers in the delightful role of Arthur's great-aunt Clementina and finally in a small but not insignificant role, Jill Coles as Nellie the maid. But truth be told all the cast were a joy to watch, and the production team of lighting, sound, wardrobe and set builders did the Ottershaw Players proud. The audience had a wonderful time, laughing so hard sometimes that the cast weren't always comfortable leaving long enough gaps after each Wilde witticism, so a few lines were lost amongst the guffaws! A thoroughly enjoyable evening. Thank you to the Ottershaw Players. As you may guess, I'm pretty happy with that. I was very worried about before the show about the length of the piece, but other trusted friends have said that it was not an issue as there were no longueurs in the performance. I was also aware that there were one or two actors who were not used to 'riding the laughs'. Apart from daily notes to this effect, there's not much a director can do about this - it's solely down to the experience and awareness of the actors involved. In any case, these are fairly minor criticisms which I am very happy to accept. I'm chuffed! All over. I thought I'd wait a few days before writing about the rest of the run - gain a little persepective. Every show was received very warmly and appreciatively by the audience. Some were kind enough to say that it was the best show they've seen Ottershaw Players do. I'm not sure if that's justified (I am more proud of our 2006 production of Habeas Corpus, personally) but it's a nice comment to receive. The reception was most gratifying. Not least because, even into production week, I wasn't 100% sure whether we had an entertaining production on our hands. I knew that the cast were perfect in their parts and that the backstage crew were giving their all to make the show a success, but I had concerns that the pace and flow of the play would be too slow and langorous. Luckily, my fears were groundless. Audience members told me that they were gripped throughout. At the interval (one hour 10 mins into the play) my wife told me that she thought it had only been half-an-hour since the play started. Phew! I'll be having a post-production meeting in a week or two. More updates then. And if anyone reading this has seen (or would like to write) a review of the show, I'd be delighted to publish it (or a copy, or link) here. Last night's show was even better than the first. The actors performed with more energy and vibrancy and continued growing in their characters and finding new ways to express the text. For the first time since getting in to the theatre, I wasn't watching with nervousness. The show was so assured that I was able to sit back and enjoy it, along with the rest of the audience - which was much larger than before, thank heavens. Only 2 more shows to go and we're finished... Time to enjoy it while it lasts! Our 'butler' has a scene where he asks the Dean of Paddington for his umbrella at a crucial stage of the action. Tonight he got confused and took the chap's brolly a page earlier than he should have done... What a to-do! Will he recover...? He did - and with a stroke of improvisational genius! Watching them do it for an audience is both gut-wrenching and exhilarating. But overall, the fact that we held the audience, gripped, for 2.5 hours and made them laugh is everything that we could have wished for. The audience's reaction is the reward for 3 months of hard work for the actors (plus another 2 months, or more, for the director and designers). This is the night that it all becomes "worth it". Last night was the Dress Rehearsal and I think it went pretty well. There were a couple of fluffed lines, which the cast covered without any problems, and one or two instances of late entrances or missed cues, but these are, I think, down to First Night nerves. I know that the performances are going to go well, though it's a huge shame that tonight's audience is so small. Only 10 people, or so! Which is very odd, considering the good numbers we have in for the rest of the run. Here's a link to a slideshow of pictures from the dress rehearsal. That's it! We've had our last rehearsal before get-in. And a very productive evening it was too. We concentrated on Act 2, which needed a little more practice, and ran a few bits and pieces over again until everyone was happy with them. I'm nervous, excited, scared, apprehensive and delighted, all at the same time. I know it's going to be a great show, but I worry about how it will be received. Ah, well. There's not much I can do anymore. The show is in the hands of the actors and they will do a superb job with it, I know. 18 days have zoomed past since I last wrote. Last Sunday we had a full 6 hours of rehearsal, complete with full costume and most props. It was a very valuable process. Not the most fluent of run-throughs, but that was probably due to working in a different environment, with unfamiliar clothing. One concern I do have is that, though books were put down weeks ago, there are still some actors who are having trouble with their words in places. I'm sure it will all come good before next week, but it's a little frustrating as I'd hoped to be having smooth rehearsals by now and would be able to concentrate more on the pacing of each scene (and thence the encompasing dynamic of the show). Overall though, it was very encouraging. I know that all the actors have a good handle on their characters - some of them maybe need to relax into them a little more - but they are all bringing a huge amount of talent, insight and humour to the production. Now - all we need is for people to buy tickets!! We've now had a "stagger" run through each half of the show. Most of the cast are now off-book, some more confidently than others, though that's not a concern to me. Once books are down, actors soon find that they know their lines better than they thought they did and confidence soon takes an upturn. Apart from a couple of tweaks which I had known about, but left until I'd known what I wanted to do with them, the whole structure of the play is hanging together well. I know that when we get into the theatre I'm going to want to adjust the blocking slightly - mainly we'll bring most of the action more downstage to use the Rhoda's generous apron area. In our rehearsal rooms, the floor area is nowehere near as deep as the actual stage, so some adjustment is always necessary. At this stage I start giving more and more notes. I think I mentioned before that the better rehearsals go, the more notes I give, and so as time passes we come up with more ways to improve the action and more ideas to make the whole production interesting. I hope the cast are getting used to this... I do have doubts in the back of my mind that I don't give enough praise (and specific praise) to each actor. When I'm happy with what they're doing I just sit back and enjoy the performance! I think that most of them have worked with me enough to know this though. At least, I hope so. My only concerns now are with other aspects of the production. I really need to get started with putting the show's programme together - we're going to take head-shots and publicity photos on Sunday, so that should get me kick-started. There's also lots of work still to do on the set. Though now my designer and set-builder are back from their family holiday, this has now got back into gear; and our redoubtable team of old reliables were happy getting on with various bits and pieces in their absence. We're keeping fingers crossed for good weather this weekend as we can only paint outside and there are about 6 12-foot flats which need a good coating of Chelsea Green. Now that the actors are starting to deal with their moves and lines with confidence (books down in 6 days now!) the play is really starting to take on a life of its own. Despite my optimism of my last post (2 whole weeks ago?!?) the next 2 or 3 rehearsals were a bit flatter than I'd hoped for and I found myself unable to find ways to inject enthusiasm and dynamism into the performances. I think that it's unsurprising in retrospect. The actors were still all very much 'on book' and struggling to remember their moves, juggle their props (sometimes literally) and handle their scripts all at once. And my higher than usual workload has meant that most evenings I'm feeling a bit drained and finding it difficult to raise my energy levels and enthusiasm for rehearsals. Not that I'm disliking the process, and I definitely think that we're heading in the right direction, but I am definitely conscious that, as Director, I need to take a lead in ensuring that the production and the actors' performances are vital and exciting. Last night was a real turning point. We rehearsed the first section of the 2nd-half of the play. This is the point at which the pace turns up a notch and the play should become an exciting farce, rather than a gentle drawing-room comedy. This coincided with our actors finding a new confidence in acting without their scripts in hand, and delivering their lines at a good pace. Over the course of the evening we reduced the run-time for this section from 35 mins to 24 mins. Even allowing for a certain amount of starting and stopping, this is good progress. We had a couple of people present for rehearsal for the first time and they were able to bring fresh eyes and ears to the work in progress. Their comments have pointed up some areas which we need to examine very soon. But their overall comments are along the lines of "I can't wait to see the completed show" - which is very encouraging! The whole cast is also committed to finding and fixing problem areas in the blocking and the dialogue. And in the post-pub production meeting (attendees: the stop-out-late cast and crew reprobates club) we talked about many aspects of the production and solved at least two problems which had concerned me for some time. I've come away from the past weekend with a renewed enthusiasm for this work.